When your requirement is to provide window shading, or simply shade over a patio door, and help control the temperature and light in a specific room then Samson Awnings have many options available. We offer outside or inside installed products for the windows or glazed roofing controlled either manually or electrically with many automatic control methods. 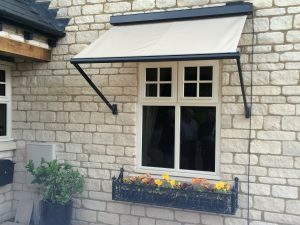 The drop arm awning cassette into which the fabric retracts is fitted above the window that is to be shaded. The Markilux 730 and 830 are identical save the shape of the cassettes being either round or square profiles. The pivotal arms, to which the lead bar is affixed, are fitted to a point on the wall that is fairly central to the drop of the window. The arms rest flat against the wall when the fabric is fully retracted and the lead bar is locked fully into the cassette. The fabric is kept under tension when extended by gas pistons at the arm pivot point. The Markilux Drop Arm Awning with Autolift Arms (791 and 891 again are identical save the shape of the cassettes being either round or square profiles). 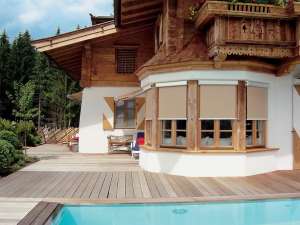 Interestingly, these awnings can actually double up as external sunshades! The arms run up and down in tracks affixedMarkilux awnings to the walls at the sides of the windows. The awnings can be adjusted to allow headroom for pedestrian walk under if fitted high enough on the wall whilst still providing internal shading. 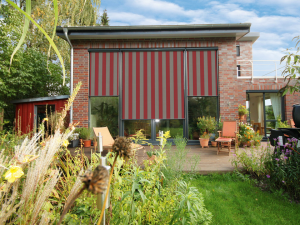 Exactly as the name implies this blind comprises of a length of fabric that runs vertically up and down, providing a different kind of window shading. The Markilux 710 and 810 are identical save the shape of the cassettes being either round or square profiles. Stainless-steel cables are affixed to the wall parallel to the drop of the blind down which the lead bar runs. Gravity reliant, this awning will not retain tautness as there is no additional tension. Either manually operated by means of a universally jointed coupling and bayonet fitting or electrically operated by a tubular motor housed in the cassette. The Markilux 750 and 850 share the same specification other than the guides are stainless steel rods, not cables. All of these awnings featured can be either manually operated by means of a universally jointed coupling and bayonet fitting or electrically operated by a tubular motor housed in the cassette. Bear in mind when fitting to a window not at ground level that manual operation is not normally an option. 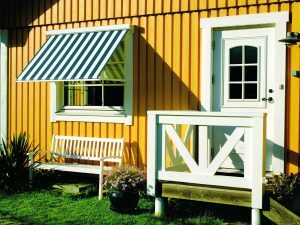 Wide choices of fabrics are available for all of these awnings. There are many more options of this type of window shades – however these featured products represent the most popular choice of the UK market.